‘The Colonel’ by Just Springer Rescue, a local charity based in Horley and Redhill. 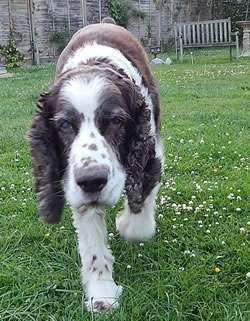 We have a lovely old boy in foster at the moment who is 11 years old. He has a real character of being the ‘Colonel ‘of the bunch so much so that we have nicknamed him ‘the Colonel’. He is a Show Springer hence his size and different bone structure with a superb pedigree having won at Cruffs as a puppy and then he grew too tall so became a pet however he moves with purposeful gait and likes to mooch about. He has an ulcer in one of his eyes and lots of wax impacted in his ears, so whilst we are fostering him at the moment there are lots of ear drops and eye drops to administer and he will need an operation to help the eye try to repair itself and give him the greatest possible chance of seeing in the future. All our fundraising goes towards these type of expenses. Whilst he is an older dog we try to ensure all dogs that JSR takes on have the best possible chance and look to match him with a forever home who will be able to look after him. Over the last few weeks he has really come out of his shell and is starting to bounce about and want to run around with the other dogs. 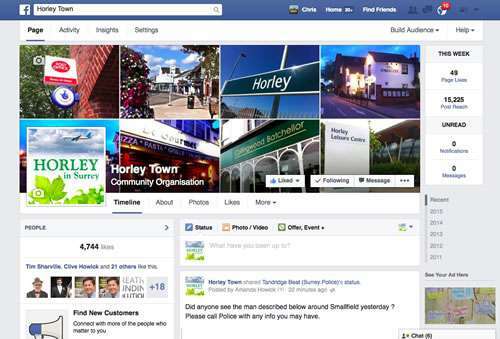 Just Springers Rescue is a local charity that is based in Horley and Redhill. We re-home English Springer Spaniels. 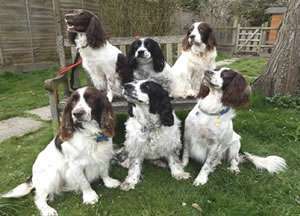 The charity was started in January 2008, and became a charity in 2010 with the aim to help and assist in re-homing Springer Spaniels to good approved homes. Just Springers Rescue is also there to help and advise owners with problems with their Springer Spaniels and to help the owners to keep their dog rather than re-home it where appropriate. We will also assess all dogs as to their suitability to be re-homed and advise the owners accordingly. All dogs that are taken on by JSR are Vet Checked, neutered, micro chipped, vaccinated, wormed, flea treated before going to their new homes. When we are approached by an owner who would like to us to take their dog there are various steps to go through. First we speak to them to understand the reasons they would like their dog rehomed, if we think we could consider taking him or her we ask them to complete our form ‘Dogs to be considered for rehoming’, to provide us with more details. On receiving all this information, if we have a suitable foster place available, we will go and assess the dog in its own surroundings. Unfortunately for various reasons the facts are not always declared on the form or in the original conversation, i.e. a dog is supposed to greet you nicely but on arrival you are lucky not to be bitten! If we agree to take a dog, he or she is taken to one of our specialist foster home with a committee member or a member of JSR for a period for assessment, this will last approximately two weeks with the dogs being assessed at all times. The short time spent in their old home is not sufficient to find out the true character of a dog. When the dogs are with one of our fosterers they are assessed in numerous ways, this includes socialising, noting general behaviour. They go out to meet people, have long walks, car rides etc. mixing and living with other dogs. During this time any medical conditions are sorted out and neutering etc. is carried out, the dogs all go to their new homes neutered, vaccinated, micro chipped, flea and worm treated. All the younger dogs are tested as to their suitability for working with the police, prison service, and border agency or to be as trained gun dogs working on various shoots. After the dogs assessment we then look through the list of people who have completed our application form to apply for a dog. We then contact the family who we feel is most suited to the dog to come and visit them, bringing all the family including any dogs they may already own. If all goes well and we are happy that the dog will enjoy living with the people concerned, we asked the family to take 24 to 48 hours to confirm if they would like the dog. Once they have confirmed they wish to go ahead, we would then go and to do a home check, before the prospective new owners are allowed to take the dog home. There are always exceptions such as a dog that is a stray, in which case the assessment period is lengthened or if a suitable home is not available we keep the dog until such time as one is, we do not place a dog where we feel it is not going to work. Click here to see more pictures on our website.